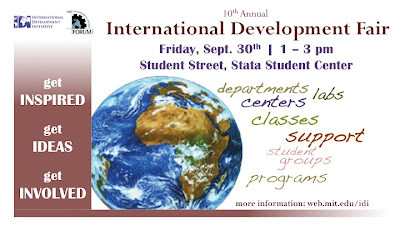 MIT IDF 2011 -- the International Development Fair -- is this Friday, 30 September from 1 to 3 pm in the Student Street ground floor of the Stata Center, Bldg 32! "Interested in International Development? Want to get involved? Have an idea but not sure how to get support for it? Come meet the many departments, labs, centers and student groups supporting International Development at MIT."